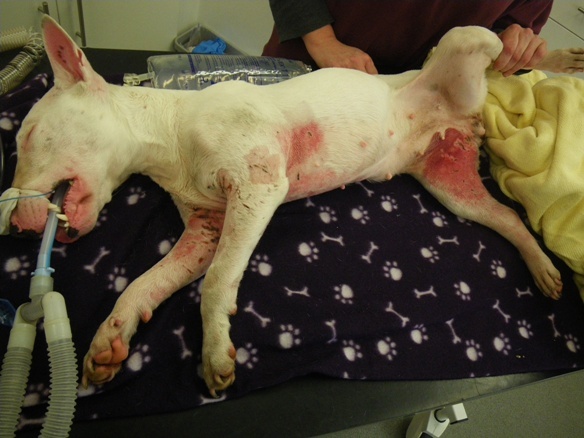 Was Bull Terrier Dumped In Botley Used For Dog-Fighting? The RSPCA is appealing for information after an injured English bull terrier was found in Botley near Southampton on Valentine’s Day. Matilda, as the dog has been named by RSPCA staff, was found at about 8.20pm on Friday 14 February. 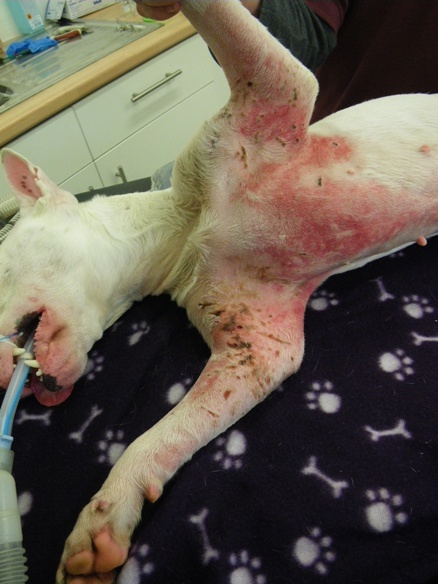 A resident of Crows Nest Lane, Botley, called the RSPCA after finding the white dog in their garden and thought she had been in a road accident as she had blood dripping from wounds on her legs. RSPCA inspector Patrick Bailey collected Matilda and found she was unable to walk and couldn’t lie down or make herself comfortable. She was also slightly underweight and very dirty. The resident told inspector Bailey that the dog had been found between a 6ft high brick wall and some fencing which was secured at both ends, meaning she had probably been thrown over the wall. Once Matilda was taken to an emergency vet, it was discovered that, rather than being caused by an accident, her injuries were puncture wounds caused by bites. After she was treated with pain relief and antibiotics, the five-year-old dog was taken to the RSPCA Solent Branch’s Stubbington Ark Animal Shelter the next day. Vets at Stubbington Ark sedated the dog and clipped her fur away. This revealed deep bite marks to each armpit, together with dozens of other smaller bite and scratch marks down her front legs, which were both very swollen. Matilda also had bruising around her chest and body and her left hind leg was extremely bruised and sore, with scars from old wounds. An older deep bite wound on her left outer thigh was healing. Inspector Bailey said: “This poor little dog would have been in so much pain – she just could not move due to her injuries. “We can only imagine what she has been through and may never fully know what she had to endure but we do know that she has been left without treatment and then been dumped. “It is thanks to the kind people who found the dog, bathed her wounds and tried to make her comfortable, that she is now being treated and cared for and has another chance. Matilda was wearing a dirty blue nylon collar with a black plastic clip. She remains in the veterinary unit at the animal shelter where she is making a slow recovery. Anyone with information is urged to contact the RSPCA inspector information line on 0300 123 8018.